This movie has a Twilight Zoney premise in which a mysterious, well groomed stranger appears in a police station on X-mas eve ready to confess to a series of murders he committed. The stranger is Kilmer and the murders actually haven’t happened yet, but Kilmer confesses to them one-by-one as he commits them throughout the film using some unexplained supernatural powers. He looks like Pitt from Meet Joe Black on a cupcake diet wearing a Mighty Thor wig and a Robert Davi mask. We must have been about 20 minutes into the movie when we figured out that the killings were revenge for Kilmer’s own death in which he was beaten/tortured by the cops in the police station. The acting was terrible, the plot was predictable. There were two incidents of decent gore but that’s about all. 1. Kilmer must wear the same outfit which hides his flabby body shape throughout the film. Dark colors and baggy coats are used often. 2. Mediocre actors must carry most of the film and Kilmer gets a combined 8-20 minutes of screen time total, mostly from a stationary position, delivering one-liners. 3. Whenever action is involved, camera tricks or stunt actors cover for Kilmer. 4. 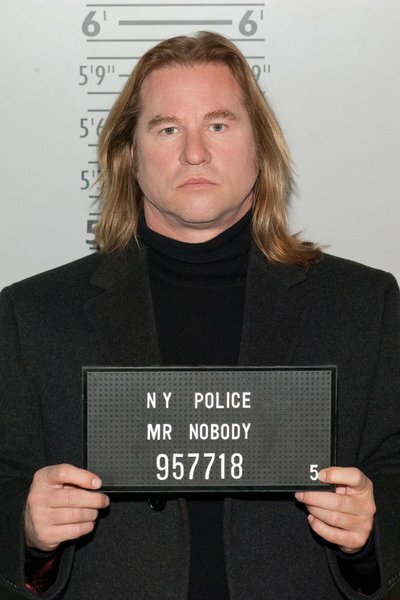 Despite appearing blatantly physically useless, Kilmer is given almost superhuman prowess throughout the film, delivering unwarranted intimidation and terror despite the fact that he is laughably chubby and in all probability on a cocktail of stimulants. I feel like this should have a name. Seagal Syndrome?